We just had a similar discussion last week at Sunlight, and I started in a similarly skeptical place, and ended up somewhere very different. First, I don’t think everything needs to be justified by a coherent theory of change, and that traditional NGO approaches to basically everything will fail all sufficiently ingranular impact measurements. And I have little faith in impact measurements. So, right off the bat, I think “we experimented with self-expression online and learned some things about how people work online” would be sufficient impact to justify what these sites are. But leaving that point about impact measurement aside, our discussion ended up illuminating a separate potential kind of impact. You identify 1) raising the issue’s profile, 2) changing public officials’ incentives, and 3) mobilizing individuals. The less quantifiable mechanism I ended up thinking about was the following: the social act itself of publicly reporting a bribe may change one’s relationship to bribing. If corruption in a place like India is entrenched, complex, and cultural (as I suspect it is), then this is a long term, complex, cultural fight. If Ipaidabribe encourages people to take the small but revolutionary act of saying they paid a bribe, and further implying that that act was inappropriate, then that’s cultural impact. I suspect that shifting cultural norms will be extraordinarily difficult to measure, but if they were easily quantifiable, that ipaidabribe sites would make a statistically significant contribution to shifting cultural norms. I expect that ipaidabribe occasionally validates empowered actors, but even if it didn’t, I think projects like it are worthwhile because they normalize publicly normative statements about corruption being wrong. It’s difficult for me to assert this with any confidence, especially because I don’t come from a culture where I’ve ever experienced petty bribery, but it reminds me of other similar projects (the “hollaback” app comes to mind” that encourage a shift in consciousness about particular situations. Even if an ipaidabribe map of reported bribes is more useful as a description of where people live who are more likely to have heard of the project, there’s utility in the social act itself, which will likely defy quantitative measurement, but could still create significant impact. In a nutshell, that’s why I fear people lending too much credence to ROI questions — it gives priority to things that are plannable and measurable, when the things we do that cause the most good so often are neither. Thank you John for your comment. I will try to address your points as best I can. First, I regret if – by any chance – my message came across as if ROI is the only thing that matters. In fact, I am very much inclined to value the non-instrumental (i.e. normative) dimension of these initiatives. In this sense, I think that “I Paid a Bribe” is already a good thing as a space for both individual expression and collective statement of normative positions. 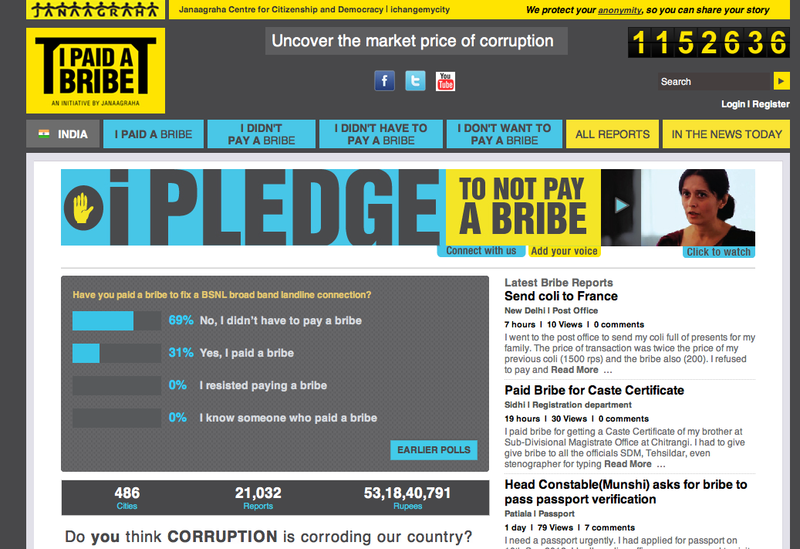 You mention a likely effect of using the website which refers to change in attitudes towards the act of paying a bribe. I fully agree with you that it is an extremely valid outcome independent of its impact on corruption as a whole in the short and medium terms. However, I am not so sure that these are not quantifiable (or identifiable) effects. For instance, there is good research on measuring changes in political efficacy that could provide some leads on how to measure the effects you mention. Some cheap – but well-designed – surveys, for instance, could help identify changes in attitudes (and behaviour?) 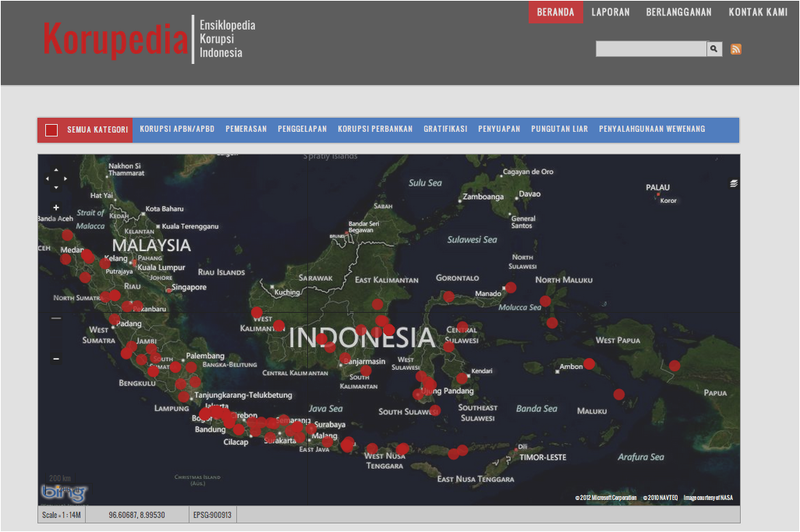 with the act of reporting bribery online. This brings me to another question regarding what I understand as impact assessment in this context. I am not necessarily referring to fancy quantitative methods or randomised evaluations. Just trying to figure out who is using the websites, how they found out about it and identifying potential changes in attitudes would already be a major step forward in knowing a bit more about whether “good things” are happening or not. Tobias Escher’s work with MySociety is illustrative of what can be done to go beyond anecdotal evidence and conjectures. To conclude, I agree with you that many things that cause the most good are not measurable. But if we want to extract more potential from actions, we should do our best to understand why and how things happen. Even when it looks like a long shot. As I’ve argued from the start, the site could be stronger if it reconceptualised itself around the idea of “I want my bribe money back”. Obviously you can’t extract stolen money from people using a website, but by setting up the workflow and the branding about the idea of actually getting your cash back would – I think – increase the attractiveness of the service to normal people, and give it a more clear sense of political purpose. I couldn’t agree more Tom. My feeling is that even just the possibility of money being returned and tracking governments’ responsiveness to that would boost external political efficacy. Which is somewhat similar to what happens with the lottery. Spot on. Thanks for the thoughtful post on this, Tiago. These questions about identifying the impact and incentive structures for participation in such sites make me think that what needs to be done, and it wouldn\’t be very hard, is gather a lot more information. Someone needs to sit down on Skype and conduct interviews with the teams behind and participants in such sites. Here’s an example to demonstrate why this is important: I recently spoke with someone in Pakistan who is thinking about replicating I Paid a Bribe (the Pakistani version you linked to is kind of dead on arrival), and he mentioned that in his own preparatory work he spoke with the I Paid a Bribe team. A key member of that team, according to him (I haven\’t verified this), has an extensive network of contacts within local law enforcement, and is therefore well situated to create actions in response to reports of petty bribery. If this is true, then I Paid a Bribe is, in fact, validating empowered actors, or the threat of it doing so is present…we *just didn’t know it*. These mechanisms may be at play elsewhere, but close watchers of technology and citizen participation and democracy won\’t know it unless they ask. I agree with you that interviews would already be great with helping to better understand these initiatives. I would complement that with you an online survey of users. Not really resource intensive is it? No I don’t think it would be very resource intensive, but I do think it should be implemented by an external actor. And an online survey of participants would be great but I’d worry about participation fatigue on the part of the users. Susannah, participation fatigue is relative: only the users who are willing will respond to the survey.The sample will not be perfect, but will be better than nothing. Even if there is some risk of participation fatigue – which I doubt – the trade-offs would be worth it in my opinion. I agree that the survey should be ideally implemented by an external actor, but if that’s not the case, I’d still go ahead and do it myself.